There’s no need to leave home to have your leather goods cleaned, refinished, or repaired. Ship it directly to Ram Leather Care. Ordering Leather Care is Convenient and Easy! Download our Order Form and follow the three simple steps at right. Return shipping from Ram Leather Care to you is FREE for all orders packaged together over $100. Return shipping for orders under $100 will be charged a flat $15 per package and will be insured for $100. If you would like additional shipping insurance, please note it on the order form. Ship using a method allowing you to track your shipment and confirm delivery. 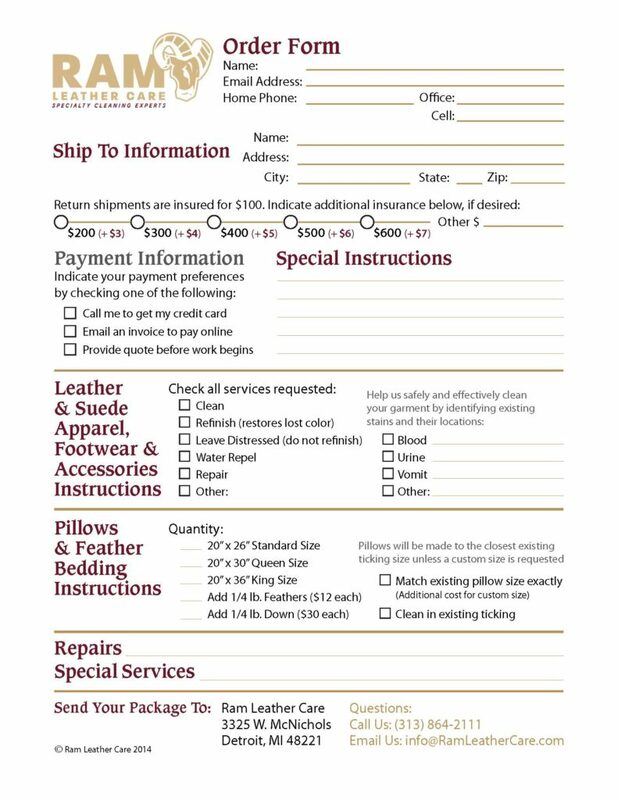 Print the Order Form and fill it out completely. Package your items and enclose the completed Order Form. Seal securely. That’s it! We’ll professionally clean your garments and ship them back to you. Call us at 313-864-2111 if you have questions or would like help in shipping your items to us.